The weather on Sat 18 March was perfect! We set up registration in the "bos" and soon after 14:00 the first runners started arriving and registering. We were blessed with a diverse crowd of great people from all over the country, and would like to thank each and every one for attending. By 15:15 we were ready for the kids' run, a highly anticipated event. The kids' course circled around the farm house, down a little koppie and through the "bos" all the way to the finish line. It was a great hit, and Hannes Kruger took first place, even after a fall!!! We all walked up to the start after the kiddies run, and the 12 km took off before the 5km route. The 12km route shared the first and last parts of the course with the 5km. 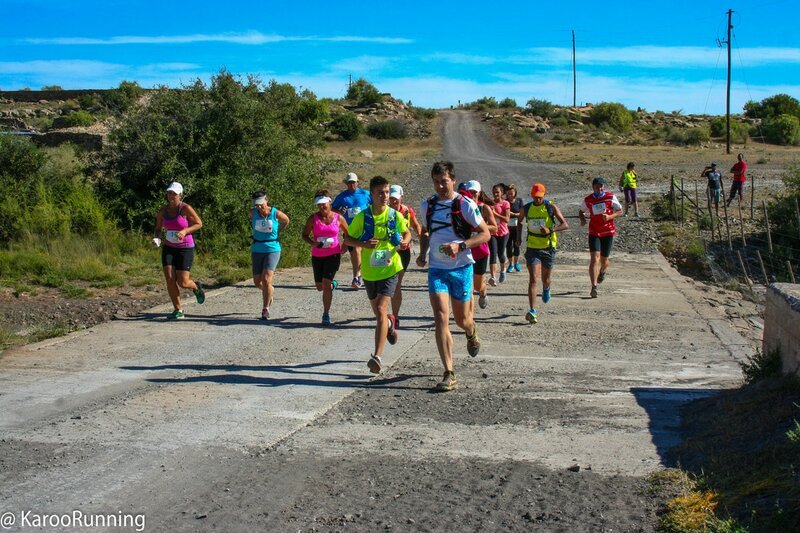 The route went along the top of an earth dam wall, up the side of a koppie, and over another dam wall before getting to the 5/12 km split. Here the longer route followed the fence line through the veldt. In the last 2 weeks "steek gras" had come out, and everyone was terrorised by the tiny, scratchy thorns from the "steek gras". Eventually the "though the veldt" section merged with jeep track, turning the route back towards the house. Just as you were comfortable on the jeep track, the route threw up its toughest challenge, and you entered a dry river bed with its walls rising up on both sides. The route went along the river bed for a large part of the run, creating a sand trap for already tired legs. As the river bed petered out in the "vlak" there was a bit of marker to marker running, and then the route merged again with the 5km route. This section followed jeep track for a while until it entered a field, and crossed to the river and the Poplar "bos". 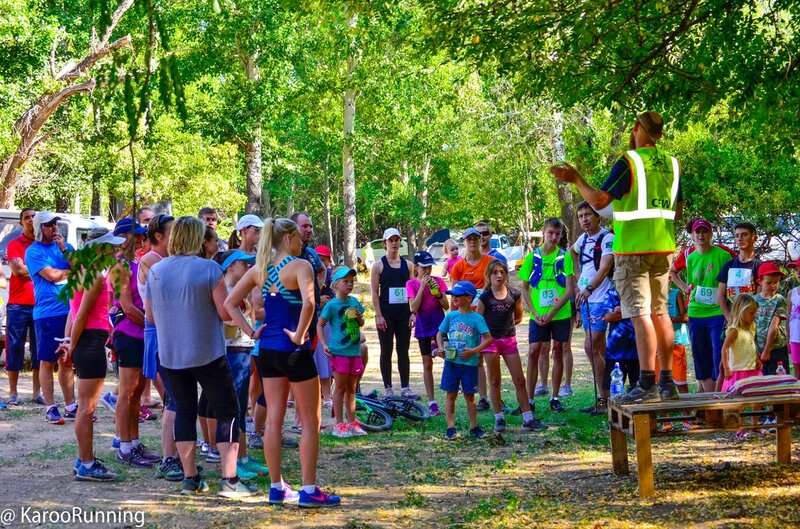 Once you went down into the river, you ran in a "forest" along the river on great single track, up the side of the river, over a fence and boom, then to the finish line. Everybody finished and had a great day out. The 5 km route was well attended with a lot of walkers as well. After everyone was done, we had a great stretch class that was lead by Caroline Minnaar, our local Pilates teacher, introducing many people to her craft! Then followed a social braai, and a very special drumming circle by Jean Djembe Drumming before we all headed off to bed and a night of well deserved rest!